Don’t you love that mysterious sounding name? I could live there. As it was, I was just visiting a friend for an overnight stay in this small Washington town which was about the same size and “feel” of the town where I grew up. It’s over the pass and on the other side of the closest mountain range to Seattle and it’s geography gives it a whole different climate. Over the pass, the sun came out and it got up to 90 degrees (again, not like Florida’s 90 degrees, but drier and with a cooling breeze). Our planned outing was a bike ride on one of the local trails. What a great way to get familiar with the lay of the land! We chose the Coal Mine Trail. It lay totally uphill for the three miles into Roslyn, the town we were heading for. A gradual incline, to be sure, but how often do I ride bike? (or exercise, for that matter?) And did I mention it was 90 degrees? When we pulled into the café at our destination and I got off the bike I felt really lightheaded and had to rest for a good bit with a blackberry soda and a sit down. And of course the return trip would have required no pedaling at all if we had wished. 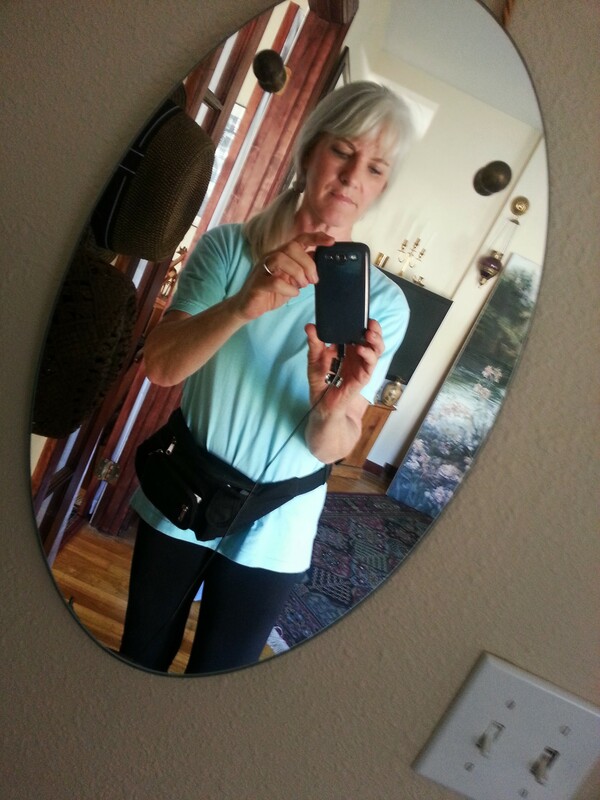 I was fully restored by the time we got back to Cle Elum. Does the name Roslyn bring anything to mind? 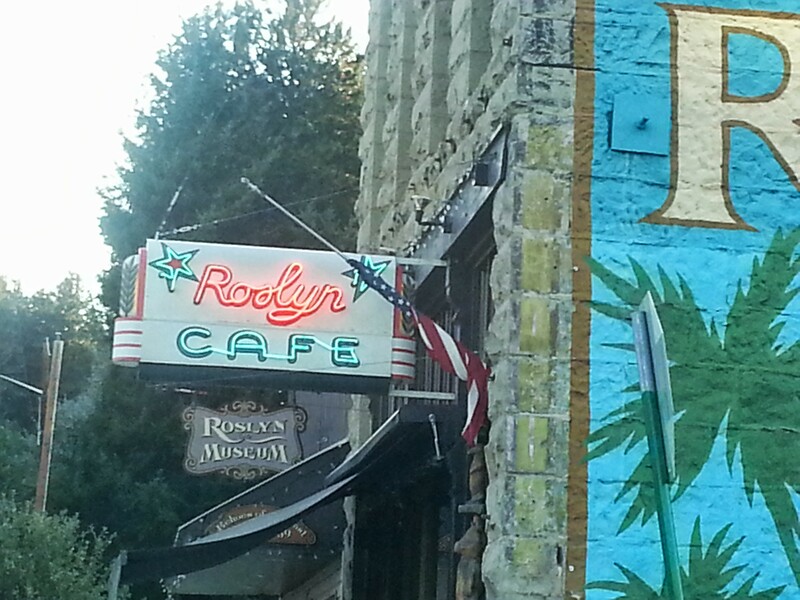 It is the town where “Northern Exposure” was filmed and we visited the Roslyn Café and saw The Brick Pub. It was a cute small town but evidently not much of a tourist draw in spite of the TV fame. We went back later by car and drove around looking at the houses on the hillsides, many of them older, in bad condition, or abandoned entirely. We drove on a few more miles to Ronald and ate dinner at a diner there. Of the three little towns I experienced, Cle Elum was definitely my favorite. Because of its proximity to I-90 there was more business, more choices of what to do and where to catch a meal. Its history included a fire which destroyed many of the homes so most dwellings were newer, well maintained but still in character with the small town ambience. Honestly, some of the streets were so wide and devoid of lines and stripes that they were like parking lots and made me feel strangely insecure. The valley around Cle Elum is wide and flat and known for its hay production and exporting. We visited a large fruit/vegetable market with a three story building housing antiques on the top two floors. I could easily have spent the whole day looking at things there but as it was, my friend found my souvenir in half an hour so we didn’t stay. I added a small cast iron turtle to my turtle collection and I was pleased since I didn’t have any iron turtles yet. Other highlights of the trip: good conversation with my friend and her mom, seeing their charming, newly remodeled residence, relaxing with several episodes of Sherlock Holmes before retiring. I’m just saying it was a good trip (including the exercise)and I’m glad I went. And would go back again, for sure.